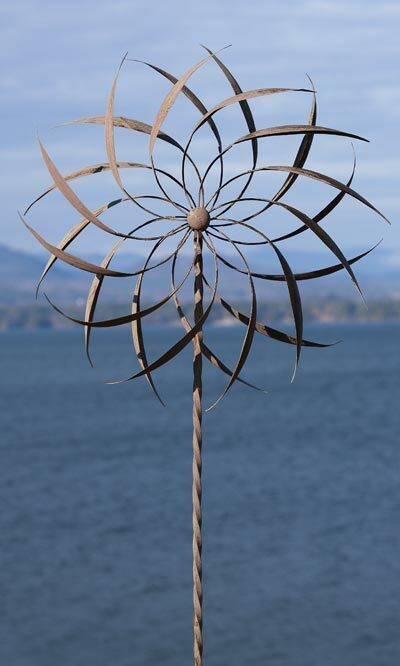 Celebrate wind power with a fantastic sculpture using the Ancient Graffiti Kinetic Pinwheel Spinner. The dual spiraling, starburst toppers bring a dramatic look to any setting, enhanced even more when they spin in a breeze. The curves on each arm help capture the wind, and the brown finish lends a natural feel to the item. These toppers attach to the included, 65.5" tall shaft, with a twisted design along it to match the spinning action. Verdigris hints throughout this adornment bring an aged look to it, and the all steel construction ensures a durable and lovely piece. Its trident base and pointed legs help this shaft install into soil with ease, and keeps the spinner stable and secure in your garden. Bring moving artwork and wind power together in your backyard with this Kinetic Pinwheel Spinner. Assembly required.